The hottest ship in the MSC Cruises fleet made her debut in the Caribbean in December 2017, the first in a new generation of cruise ships featuring revolutionary architecture and cutting-edge technology. The MSC Seaside, the first MSC ship to be christened in the United States, offers Eastern and Western Caribbean itineraries year-round. With a capacity of 4,140 passengers, she is in the same league as the larger ships sailed by other major cruise lines. Guests board the ship from a newly refurbished and expanded terminal at Port Miami, Florida, along with the MSC Divina, which will sail the Caribbean seasonally. Terraced Balcony Staterooms — A first of its kind in the industry, part of the balcony is shaded and part open to the sun, overlooking the ship’s promenade. Unique View of the Sea — Three glass-floor catwalks extend beyond the edge of the ship, giving guests the feeling of walking on water. 360˚ Waterfront Promenade — This thoroughfare wraps around the whole ship, offering a variety of places to shop, eat and sunbathe. Designed With Families in Mind — This ship has modular staterooms and kids-only restaurants, and kids 11 and younger sail FREE as the 3rd/4th guests in a stateroom. Largest & Most Interactive Aqua Park at Sea — It’s the first ship to offer slide boarding technology, combining a water slide with an interactive game that adults and kids will love. Interactive 5D Cinema — Enjoy an interactive movie experience with moving seats and special effects. Enhanced MSC Yacht Club — The ship’s luxury enclave has private Jacuzzis and hanging gardens. To see for yourself, take a video tour of the MSC Seaside. Book a 2019 Cruise Aboard the MSC Seaside Now! Check out a few of the exciting MSC Seaside itineraries, and then call Bluegreen Travel Services at 855.645.2215 to book your cruise today. Call 855.645.2215 to Book Your MSC Seaside Caribbean Cruise Today! 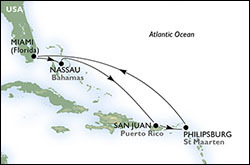 *TRAVELER PLUS POINTS-FOR-CRUISES BENEFIT TERMS & CONDITIONS: In order to apply any combination of annual, biennial, borrowed or rented Bluegreen Vacations Points for payment, cruise fare, including base fare and taxes, must be a minimum of $500 per person for the first and second passengers in a cabin, for a total minimum fare of $1,000. Benefit applies only to active Traveler Plus members. (1)Prices are shown in U.S. dollars. Prices are per person, for cruise only, based on double occupancy. Government fees and taxes are additional. Fares shown for MSC Cruises are applicable to residents of the U.S. and Canada only. See complete Terms and Conditions. (2)Price is per-person based on double occupancy, cruise only for select sailing date and stateroom category, and includes port charges. Government taxes and fees are additional. Prices, additional fees, itineraries, and availability are subject to change without notice. Fares shown are in U.S. dollars for new reservations only and are subject to availability. Deposit of $250 due at time of booking. Please call us at 800.459.1597 for more information. Onboard service charges are additional, may be automatically added to your onboard account, and are subject to your discretion. Certain terms, conditions and restrictions may apply. This offer may not be combined with any other offer/promotion and may be withdrawn at any time. Not included: air transportation, airport transfers, car rental, and items of a personal nature, restaurant fees, some beverages, photographs. Great Vacation Destinations, Inc., doing business as Bluegreen Travel Services, is located at 12400 S. International Drive, Orlando, FL 32821. Great Vacation Destinations, Inc. is registered with the State of California as a Seller of travel Reg. No. 2068362-50 (registration as a seller of travel does not constitute approval by the State of California); Washington Seller of travel Reg. No. 602-283-711; and registered with the Airlines Reporting Corporation (“ARC”) number 15-72225-4. In the event of a conflict between MSC Cruises’ Details of Participation and Great Vacation Destinations’ Details of Participation, MSC Cruises’ Details of Participation shall govern.